I’ve always thought of socks as great way to express my personality. With the exception of holiday socks (always in style), my preferences have changed a lot over the years. When I was little, my socks were white with lots of ruffles. In my early teens, I mostly wore ankle socks with cute prints. During college, I loved to show off my collection of colorful knee-highs at cheerleading practice. And when I was working as a reporter, I didn’t care what my socks looked like as long as they were dry and warm! It seems the only thing that’s really been missing from my sock drawer is a pair of handmade socks, though not for lack of trying! My first attempt was when I was learning to crochet. Back then I knew nothing about yarn or gauge – I hardly knew where to stick my hook. Not surprisingly, I ended up with a knee-high barely wide enough to accommodate my big toe. Other attempts were too large and generally shapeless. I’m still not sure if my knitting skills are up to the sock challenge, but the finished pairs I’ve seen online lately are tempting me to give it a try! Raveler eruuska’s fish socks are mainly knit in the Knightley shade (#1453) of Berroco Sox. The self-striping blue-green yarn provides a perfect aquatic backdrop for the intentionally mismatched fish motif taken from Mariann An’s “Who Ate the Fishes” pattern. Because eruuska left out An’s other design elements and chose more natural colors, she ended up with a unique pair of handknit socks! I love the texture created by the diamond pattern and lace stitches in Cookie A’s Wanida sock pattern. But I think it looks even better knit in the Southland shade (1813) of Berroco Comfort Sock! 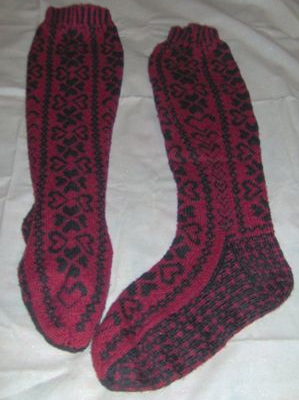 Raveler Bettesocknitter was especially proud that she was able to extend the pattern to fit her husband’s foot. She says she has one more skein that she plans to use to knit the same socks for her son-in-law. Marybeth’s colorful knee-highs are the kind of funky socks I would love to knit someday. She used one strand each of Berroco Comfort Sock in True Red (1757) and Liquorice (1734) to create the Fair Isle-esque pattern. Amazingly, it only took her four days to finish both socks, though she warns she’s faster than the average knitter! Thank you kindly for showing off my socks. I am a prolific knitter and go thru 75-100 skeins of Berroco a month! Sock knitting is my favorite thing to make, other than shawls of course! That’s amazing! Keep up the good work, Marybeth! the goldfish socks are nice. i don’t have the patience for socks. once i finish one, the idea of starting all over again drives me crazy! Knitting socks is difficult for me. But I still love funny socks anyway.